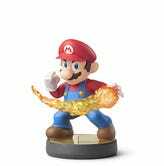 Nintendo's Amiibo figures are, like Skylanders and Disney Infinity, designed first and foremost for video games. But where they differ from Activision and Disney's efforts is that I would buy all of these just to sit on my desk, quality of the games be damned. Especially since, at $13 each, they're comfortably in "I'm just looking on the internet wait why am I getting my wallet out" territory. Now that they've got a price, release window and preorder links, we've got better images of the figures, and as you can see below, they are awesome. All twelve figures in the first line - whose first compatible game will be Smash Bros. - are out around the holiday season.